Founded by Greg Carter and Chad Carey in 2004 as a niche tailor-made travel service for clients travelling to South America, Chimu Adventures soon expanded to include Latin America and Antarctica small ship cruises. Runs exclusive charters that are also fundraising trips. The company operates exclusive departures that are run as fundraisers as well as expeditions. So far Chimu has raised funds for both the Mawson's Huts Foundation and the McGrath Foundation. It also offers spaces on charters that will benefit the MAD Project (Make A Difference) and Garvan Institute to help raise money for breast cancer research. Chimu's cruises aim to give passengers both an extensive onboard and shore immersion to ensure travellers gain a true understanding of the destinations they visit, not just a view from a window. The management employs only experienced travellers who are experts in its destinations. These staff offer first-hand advice, specialist knowledge and a genuine passion for South America and Latin America. On the ground, Chimu exclusively employs locals with exceptional knowledge and commitment to service. An all-suite ship, Sea Spirit is a comfortable, budget-priced option for visiting Antarctica. This sturdy vessel is well equipped for the region's harsh environment. Chimu passengers are attracted to the flexible itineraries and enjoy boutique-style cruises. They seek the road less travelled as well as the major highlights. 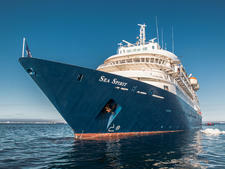 The company operates exclusive departures on three ships: Sea Spirit, Sea Adventurer and Ushuaia. In Latin America, Chimu works with small ship operators in the Galapagos, the Amazon, Patagonia, and Central America. All of the vessels are inspected and approved by Chimu management.